The OP4RE Consortium required a Grey Box Infrastructure Penetration Test and a WebApp Penetration Test on their information environment hosting the Proctor Exam platform. The scope was to identify whether students could abuse the platform via a set of scenarios agreed between the test team and the owners of the ProctorExam platform. We invite all our Associate partners to join us as we share the final outcomes from our 3-year Online Proctoring for Remote Examinations (OP4RE), an Erasmus+ funded project. Identified by our commercial partner, ProctorExam, as currently the ‘largest global research project into online assessment’, the outcomes from OP4RE are expected to set the standard for online proctoring and offer a significant contribution to the field of delivering safe and secure online examinations. The outcomes are relevant not just to other European countries and our EU funders, but will be of broader international interest as well. Booking: Places are limited for this event and we expect much interest from the wider education environment. Booking will open at the end of March 2019 for our Associate Partners exclusively, before it is opened more widely to other interested parties. Initially we will allow up to 2 delegates from each Associate Partner to register. More details are on the OP4RE website which will be updated regularly. Location: The location of the OP4RE multiplier event is ‘The Fielder Conference Centre’, University of Hertfordshire, Hatfield, UK. Hatfield is straightforward to access by train from London within 30 minutes, including via the Eurostar, and it is easily accessible from local motorways by car. It is convenient for Luton airport and there are transport connections via London to the other London airports. There are local hotels to suit all budgets and this semi-rural area of Hertfordshire offers many historic towns and tourist sites for those who can stay for a longer visit. Interested to attend this event? Leave your contact details here. On December 10th and 11th, 2018 several colleagues from the OP4RE project attended the TEA Conference in Amsterdam. Amanda Jefferies presented in a paper session on: Support online distance learners taking assessments: reviewing the options for remote vigilation. Pierre Beust explained more about online proctoring in France: Remote monitoring of examinations at the students’ home in French university distance learning. On the 28th of June 2019 the OP4RE project will organize a multiplier event at the University of Hertfordshire, UK. More info: coming soon. Interested to participate? Leave your contact details here. Silvester Draaijer and Daniel Haven comment on online proctoring of remote examinations, as a tool for long-term change and the OP4RE-project in News Tank Exclusif. Proctor Exam was involved in this project from the beginning. Other members, forming the strategic board of this project, are, : the Free University of Amsterdam, the Erasmus University of Rotterdam, University of Hertfordshire, Hasselt University, Fontys University of Applied Sciences, Wilhelm Büchner University of Applied Sciences, FIED (Fédération interuniversitaire d’enseignement à distance), in addition to 20 Associate Partners from across Europe. The project is still in the experimental stage. Several countries are developing initiatives on the subject to meet a need that is identified and awaiting a response. ProctorExam is the only Edtech company that is a strategic partner of the European consortium OP4RE. It’s Daniel’s opinion that the market is facing the need to build its long-term vision to take into account digital transformation. What about fraud? In Silvester Draaijer’s opinion, remote monitoring of exams is more fraud-resistant than traditional monitoring, due to the control process itself. The simultaneous recording of the various video channels, including that of the student’s computer screen, makes it possible to ensure that the candidate’s activity is recorded during and after the test. A potential barrier concerns confidentiality in the processing of personal data. This is the subject of the group’s working seminar in Paris, on 05/10/2018. “Remote monitoring creates the processing of personal and sensitive data that must be analysed and monitored. It is in this sense that we will work with these specialists in the subject, who themselves are in contact with the Cnil. Imagine all the scenarios used to define the processing operations. We also invited a consultant from PricewaterhouseCoopers, who specializes in data legislation. The work on impact assessments under the DGPS should make it possible to standardise practices in the European Union, bearing in mind that we must also take into account certain legal provisions that are specific to each Member State because of the margin left since the entry into law of the European Regulation. Within the European consortium it is possible to develop new boundaries and to create documentation on practices for institutions and the professionals concerned. Daniel Haven (ProctorExam) presented on 25 October at the TesLA conference on e-assessment market trends. Silvester Draaijer and Sabine Bottin presented the OP4RE project at the LERU Online Blended Learning Conference of 9 November 2018. For the upcoming international Technology Enhanced Assessment conference 2018 (TEA2018), the OP4RE project had four successful submissions. The first submission is a practice poster by Gwendoline Somers and Silvester Draaijer about Coping with students’ anxiety and concerns when using online proctoring for the first time. 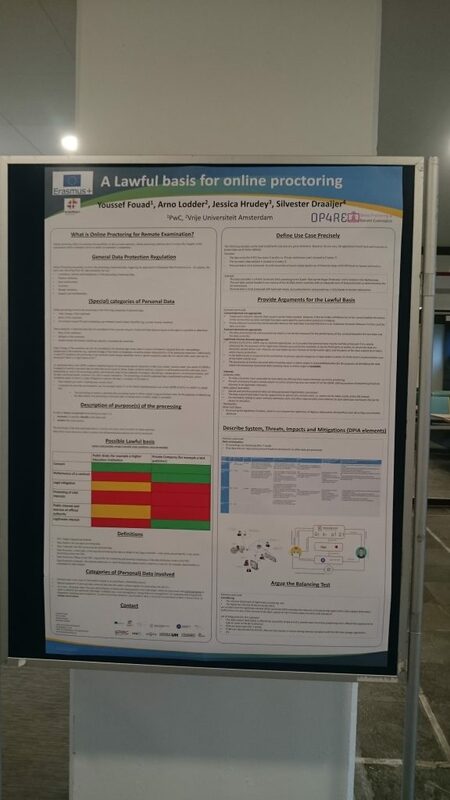 The second submission is a practice poster by Silvester Draaijer, Arno Lodder, Jessica Hrudey and Youssef Fouad ‘A lawful basis for online proctoring’. Further a practice paper by Amanda Jefferies, Karen Barton, Andrew Pyper, Jonathan Meere, Amanda Yip, Stilianos Vidalis and Sulanie Peramunagama ‘Support online distance learners taking assessments: reviewing the options for remote invigilation’. Finally, a study by Nicolette van Halem, Chris van Klaveren and Ilja Cornelisz about barriers using online proctoring was accepted. We believe that the experiments that are conducted as part of the OP4RE project are gradually resulting in valuable outcomes for the wider scientific and practice assessment community. On the 27th LEARNTEC (https://www.learntec.de/en/) conferene Michael Fuchs (WBUAS) will present the OP4RE topic. Topic: Rechtssichere Online-Prüfungen zu Hause, in English: Legally compliant online exams at home. Which EU and national privacy legislation applies to online exam makers and surveillance institutions? Are more safety procedures required for an online exam compared to a regular exam? Which accreditation frameworks are there for online learning and assessment? What are the most practical procedures to promote the accreditation of online assessment? For which target group does online surveillance offer a practical, valuable solution? What do educational institutions need to do to increase the accessibility and ease of use of online proctoring? The German Aviation Authorities approved using a type of online proctoring for assessments. The ProctorExam platform is the first to be approved. Following our third transnational meeting in Paris, we provide you with an update on the OP4RE project. For the upcoming international Technology Enhanced Assessment conference 2018 (TEA2018), the OP4RE project had four successful submissions. 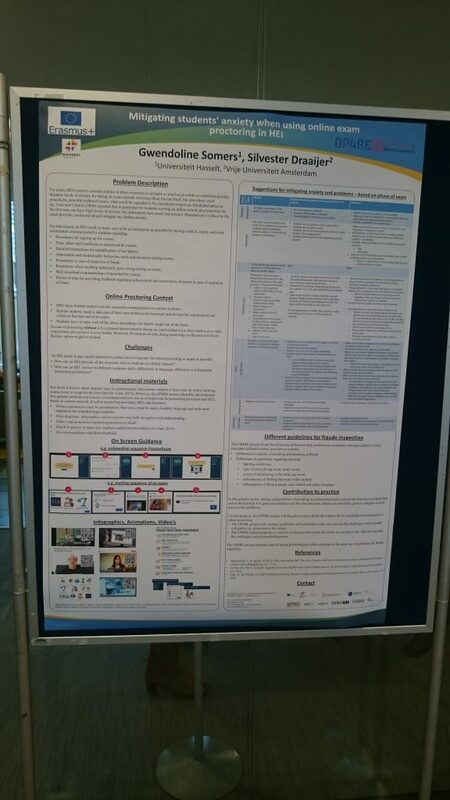 The first submission is a practice poster by Gwendoline Somers and Silvester Draaijer about Coping with students’ anxiety and concerns when using online proctoring for the first time. The second submission is a practice poster by Silvester Draaijer, Arno Lodder, Jessica Hrudey and Youssef Fouad ‘A lawful basis for online proctoring’. Further a practice paper by Amanda Jefferies, Karen Barton, Andrew Pyper, Jonathan Meere, Amanda Yip, Stilianos Vidalis and Sulanie Peramunagama ‘Support online distance learners taking assessments: reviewing the options for remote invigilation’. Finally, a study by Nicolette van Halem, Chris van Klaveren and Ilja Cornelisz about barriers using online proctoring was accepted. We believe that the experiments that are conducted as part of the OP4RE project are gradually resulting in valuable outcomes for the wider scientific and practice assessment community. You can still register for the TEA2018 conference. Daniel Haven (ProctorExam) also presented on 25 October at the TesLA conference on e-assessment market trends. And lastly, Silvester Draaijer and Sabine Bottin will present the OP4RE project at the LERU Online Blended Learning Conference of 9 November 2018. Next to these presentations and postersessions, Daniel Haven of ProctorExam and Silvester Draaijer were interviewed by the French online newssite NewsTank. In the interview they discussed the future of online proctoring in higher education, based on the experiences gained in the OP4RE project. The experimentations show that for a number of applications, online proctoring can gain a substantial share of ‘the market’ for examination in the upcoming 5 to 10 years. Though the technology actually already works, a relatively slow uptake will take place. This is because of the many cultural and organisational changes that are needed to accept and support this form of proctoring. Also, in the context of the EU, the complex and often ambiguous GDPR regulations with regards to special categories of data and specific legal exceptions. It will take time, development of practices (as is one of the goals of the OP4RE project) and recognition of practices to move forward. The article can be found here (behind subscription wall unfortunately). The work carried out within the framework of IO3 on bring your own device, in the recent months has consisted of several actions. First, as part of the FIED network, the Universities of Caen Normandy and Sorbonne University continued to compare their remote monitoring approaches. This has led to several publications (at Presses Universitaires du Québec, EADTU conference, TEA2018 conference) and two presentations at the the Online, Open and Flexible Higher Education Conference, OOFHEC2018, in Aarhus 10-12 of october 2018. Secondly, a major safety certification work within the framework of the GDPR was carried out at Caen University and this work was shared with OP4RE partners during the transnational meeting in Paris. Finally, FIED is still in the process of discussing the establishment of a framework contract with the French company Managexam to provide simplified access to a remote test monitoring service for FIED members. The idea of making it easier for higher education institutions to experiment and access remote monitoring to improve the flexibility in their distance education. The German Aviation Authorities approved using a type of online proctoring for assessments. This is interesting for the OP4RE project. It is a precedent in Germany for any government body using online proctoring (read more). In October the team of the Wilhelm Büchner University (IO 5 on privacy) conducted a second online proctoring experiment. The test simulated an exam with seven students. Two proctors monitored the exams online and in real time with the software of our project partner ProctorExam. The ProctorExam team provided technical support during the test. The online exams used were digital versions of real exams used at Wilhelm Büchner University. The aim of the experiment was to test the use of the software in the live monitoring process under realistic conditions. In the long run, on site paper based exams and off site online exams should be made comparable, giving students the opportunity to choose between those two options. Risbo has also started organizing various pilots. For example, they want to offer a mathematics test with online proctoring for international students, and they set up a pilot project regarding decentralized selection of students with the faculty of Medicine. In recent years, Erasmus MC organized the decentralized selection examinations for potential medical students from Aruba, Bonaire, Curacao, St. Eustatius, St. Maarten and Saba on the spot. Potential students from these islands came together at one place where the exam was taken on paper, under the supervision of employees of the Erasmus MC. In 2019, Erasmus MC and Risbo want to ensure that these examinations are taken with Online Proctoring. Early in the 2017-18 academic year an initial discussion took place to determine the most likely scenarios for challenging the security of an online provider of proctoring between the OP4RE team member from the University of Hertfordshire Cybersecurity group and the ProctorExam Chief Technical Officer. They followed the approach known as the TAME methodology to assess cyber threats. As a result a set of scenarios was devised for the penetration testing of the ProctorExam systems which typified the kind of hacking which a student or their associate might make. The ProctorExam systems withheld the attack and none of the attempts were successful in hacking into the systems or delivering a Denial of Service. The IO2 team have continued through to develop a set of the typical risks which online proctoring situations might be faced with during the taking of an assessment and in discussions with other teams we have proposed opportunities for mitigation. This area of our work is under wider discussion currently.